The Subsistence Marketplaces Initiative (SMI), in the College of Business at the University of Illinois, has pioneered a bottom-up approach to research and practice at the intersection of poverty and marketplaces. Our efforts in research have generated more than 40 authored publications, and we have edited roughly 60 refereed publications through special issues and organized six biennial conferences bringing together scholars and practitioners. Direct educational experiences, derived from our experiences on this topic, reach almost a thousand students a year at the University of Illinois and many more students online, including a yearlong interdisciplinary course and a one-of-a-kind international immersion experience that has been ranked one of the top 10 entrepreneurship courses by Inc. Magazine. Educational materials are disseminated worldwide through a web portal. This work has led to a unique marketplace literacy educational program that tens of thousands of individuals have received in eight countries – India, USA, Tanzania, Uganda, Argentina, Kenya, Mexico, and Honduras through the Marketplace Literacy Project, a non-profit organization founded in concert with this initiative and other partners. 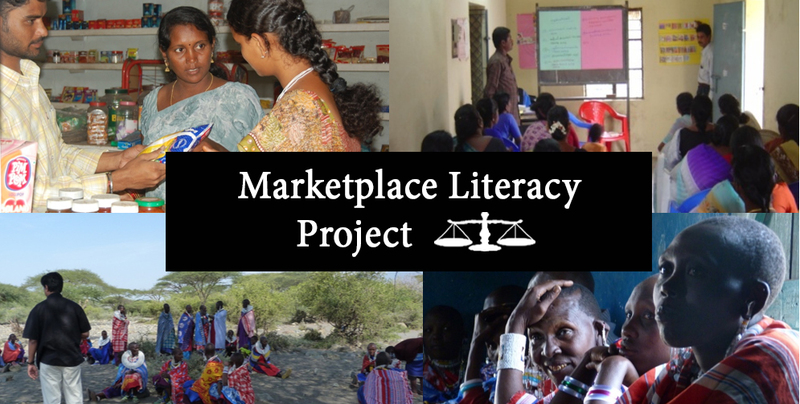 The Marketplace Literacy Project enables marketplace literacy among low-literate, low-income individuals through educational programs and through dissemination of educational materials to improve the practices of businesses, governments, not-for-profit organizations, and educators. Whereas micro-financing and vocational literacy have been emphasized in recent decades, our emphasis on generic consumer and entrepreneurial literacy supplements these very important efforts in the economic realm and addresses a central need. This program uses the “know-why” or an understanding of marketplaces as a basis for the know-how of being an informed buyer or seller. Despite the difficulties with abstract thinking that low-literate individuals may experience, such education enables deeper understanding of marketplaces by leveraging the social skills that participants bring to the program and relating educational content back to their lived experiences. The approach is documented in a book "Enabling Consumer and Entrepreneurial Literacy in Subsistence Marketplaces” . Following extensive piloting and assessment, Marketplace Literacy Communities – in Chennai, run by local team members who grew up in poverty and its partners have provided marketplace literacy education and to more than 40,000 women in urban and rural Tamil Nadu, India, and manages 150 self-help groups of women in many neighborhoods in Chennai. Although the starting point was a face-to-face program, multi-media based, teacherless methods have been designed and used for wider deployment. Marketplace literacy programs are offered through local teams in Tanzania (reaching 1000's of tribal women in 8 geographically dispersed areas with a partner), Argentina, Honduras, a refugee settlement in Uganda, and Illinois (blended with maker literacy and reaching 1000's of individuals). If you would like to learn more, we encourage you to visit the website below, take part in our award winning Coursera course, or check out our online subsistence marketplaces simulation.